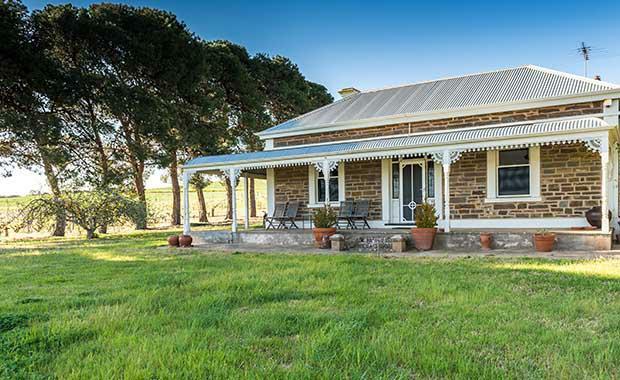 One of the earliest properties to be established in the Barossa Valley wine region, Greenock Farm, is set to hit the market in an opportunity for a savvy buyer to break into one of Australia’s most tightly held wine regions. Colliers International’s Tim Altschwager and Nick Dean have been appointed to market the business and assets of Greenock Farm, a well established and highly regarded wine business. “The Greenock Farm vineyard is owned by Russell Wines, a highly regarded family owned label within the region, best known for consistently producing small parcels of premium wine,” Mr Altschwager said. “This rare opportunity represents the chance to gain a strategic foothold in one of the most tightly-held wine regions in Australia. “On offer is 40 hectares of premium land incorporating 12.2 hectares of ancient varietal plantings on proven terroir. Mr Altschwager said the Greenock Farm vineyard was one of the first properties to be established in the area. “The 120-year-old stone residence and farm buildings are surrounded by 100-year-old vines planted predominantly to Shiraz. 2004 saw the first vintage under the Greenock Farm label, which has since expanded and diversified to produce three signature limited-run varieties, The Fenceline, The Victor Shiraz and The Amegilla. Russell Wines was awarded 5 stars and a spot in the Top 10 New Wineries Award for the 2009 James Halliday Wine Companion. Mr Dean said the Barossa Valley wine region was world famous for its sophisticated and bold examples of temperate climate wines, and arguably most famous for its prize winning signature variety, Shiraz. “The Barossa Valley is the most prestigious and historic wine region in Australia,” Mr Dean said. “Iconic wines are produced from premium vineyards, some dating from as early as 1840, surrounded by some of the most pristine and tightly-held countryside in South Australia. Mr Dean said that Barossa’s signature variety is undoubtedly Shiraz, with other varieties grown in the region including Grenache, Cabernet Sauvignon, Mourvedre, Merlot, Riesling, Chardonnay and Semillon. “Wine tourism is a significant cultural characteristic of the Barossa region, and proximity to Adelaide allows visitors an uncompromised approach to sample and enjoy all the Barossa has to offer. The historic, double-fronted stone homestead (circa 1890) comprises three bedrooms, open plan kitchen and dining, lounge, sitting room, bathrooms, laundry, separate toilet, pantry, and is well appointed. The associated stone farm buildings (in need of total restoration) are in the same style as the principal residence, dating back to circa 1851 when the property was founded.